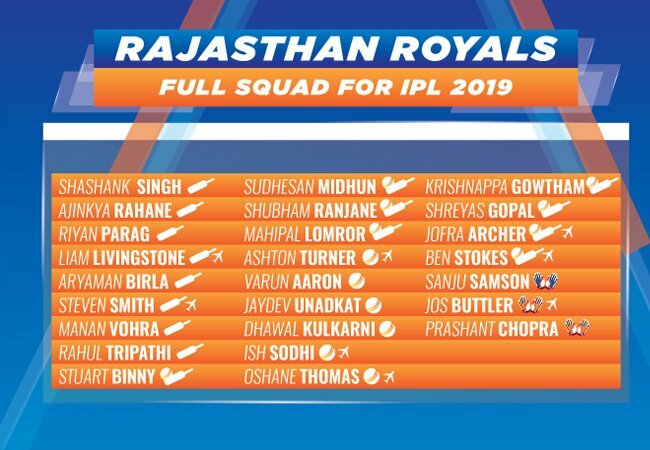 Rajasthan Royals Predicted Playing XI: CrickeX presents before you Rajasthan Royals’ playing XI for IPL 2019. Rajasthan Royals came back strongly to finish IPL 2018 as the fourth team on the points table. It wouldn’t be wrong to say that not many people had expected them to do so well and it was their ‘dark horses’ status which worked well for them. Royals followed their strategy of backing young and rookie overseas players in the auction before this season. Apart from going all out for Jaydev Unadkat, they bought another Indian fast bowler in Varun Aaron. Among the other players which they bought in this auction included two overseas middle-order batsmen, a few uncapped Indian players and a 17-year old opening batsmen from Assam. Having won the inaugural edition of the tournament in 2008, Royals haven’t been able to reach the finals of the IPL since then. The franchise would be hoping for the players to put a halt to the 11-year gap now. Rajasthan Royals erred big time in the staring phase of IPL 2018 by not sending wicket-keeper batsman Jos Buttler at the top of the order. Post making the decision, Royals saw an immediate change of fortune. Not wanting to repeat the same mistake, the team management is most likely to send Buttler and Ajinkya Rahane to face the new ball. Given their contrasting batting style, one expects them to compliment each other well. Rajasthan Royals would be expecting Steven Smith to both lead the side and bat at No. 3. However, his recent elbow injury has it in it to keep the Royals in limbo. Given the ongoing uncertainty over his recovery, it will be really hard for him to take part in the initial stages of the tournament. If that remains the case, Royals are likely to continue with Rahane as the skipper. Talking of the No. 3 position, Rahul Tripathi can be a useful option for RR. Sanju Samson, who scored 441 runs in 15 matches at an average of 31.50 and a strike rate of 137.81 last season, will be expected to continue bettering his impressive IPL record. The 24-year old batsman will be accompanied by England all-rounder Ben Stokes in the middle-order. Having not performed to what is expected from someone of his potential in the T20 format last season, Stokes would be keen to make amends this time round. His all-round skills unequivocally have in it in them to turn the season around for the Royals. In the 14 matches which Ashton Turner has played for Perth Scorchers in the ongoing edition of the Big Bash League, he has scored 378 runs at an average of 31.50 and a strike rate of 132.63, including three half-centuries. With him also in Australia’s ODI squad for India tour, Rajasthan Royals would be wanting him to play with the same confidence in his maiden IPL stint. There is no hiding to the fact that all-rounder Krishnappa Gowtham was one of Rajasthan Royals’ find in IPL 2018. Right from bowling in the powerplay to playing the big shots during the death overs, Gowtham is a trademark T20 all-rounder who will mostly bat at No. 7 this year. Much like Gowtham, fast bowler Jofra Archer has not just been Royals’ find but a find for T20 leagues around the world. Having dismissed 15 batsmen in 10 matches at an average of 21.66, an economy rate of 8.36 and a strike rate of 15.53, Archer would be wanting to rope in another such performance this time round. 11 wickets in 15 matches at an average of 44.18, an economy rate of 9.65 and a strike rate of 27.45 did no justice to Jaydev Unadkat’s hefty price tag of INR 11.5 crore. After being retained and again bought for INR 8.4 crore speaks highly about Royal’s trust in the 27-year old fast bowler. While Ranji Trophy is a different format altogether, his recent performance in India’s most prestigious competition should give him the required confidence for IPL 2019. Having bought bowler India fast bowler Varun Aaron, Rajasthan Royal should play him ahead of Dhawal Kulkarni, who picked four wickets in eight matches at an average of 47, an economy rate of 9.47 and a strike rate of 29.75 last season. Shreyas Gopal, who counted for 11 wickets in 11 matches last year at praiseworthy numbers, should also get a go in Rajasthan’s initial playing XI.